April 11, 2009 – It’s Semana Santa, and we prefer to stay off the highways. From day before yesterday through tomorrow, it’s one of the main holidays of the year here… and we really stay off the highways! We’re about to walk down for lunch to our favorite local restaurant, Viva Mexico, here in San Juan Cosala… we often do that. There are a number of vacation homes owned by Tapatios (people from Guadalajara) in our neighborhood, and quite a few of them are here for the weekend. We groaned to each other as we noticed this, remembering some really loud parties we have endured in the past, but so far so good. They are all quite sedate! Or at least quiet! Here is a really interesting article about Mexico that was published in the New York Times. Enrique Krauze, who wrote it is a brilliant Mexican historian, essayist and publisher. It was written about 3 weeks ago in, and tackles questions of drug cartels and more. Mexico-with-heart.com began as a result of a trip Kelly and I took around various parts of Mexico in our motorhome in 2003. That link takes you to the beginning of the book I wrote as a result. Six years ago, blogging wasn’t nearly so big and besides we were offline a lot. So I wrote the book, self-published it, and later put the whole thing up on this site, complete with lots of color photos I couldn’t afford to put into a paperback book. I added information about various places in Mexico, too. 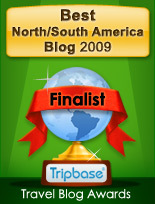 In November 2004, I started this blog. All that adds up to a sprawling array of some 683 pages. So this week I bought an online course on how to transfer HTML websites to WordPress, best known as a popular blogging platform but also well suited to creating sites. I am well into making the switch with another old site of mine, but it only has 83 pages. I’ll decide about this one later. The goal would be to make the information more accessible, chiefly. Readers of my blog, I am curious: have you ever ventured onto the website itself? Thank you for your comment. Chihuahua really is a great and beautiful place with so much rich culture. If only people could see behind the bad stuff they hearon the news! I am actually leaving tonight for a visit to the United States to get my passport, so I have to travel by bus first through Juarez to catch a plane in El Paso. I am a little nervous, so wish me luck! I will be following your site and reading your book. Thanks again and keep in touch! Hey Chihuahua girl — hope your trip is just fine! Thanks, Litchfield reader… I write for people like you but I don’t usually know anything about you. Hope the timing is perfect for your arrival.